Mon - Thu: 08:00 a.m. - 07:00 p.m.
Fri: 08:00 a.m. - 04:00 p.m. Sat: 11:00 a.m. - 03:00 p.m.
Click here for Emergency services ». If teeth are missing or are severely damaged and cannot be saved by a normal filling, modern dental technology ensures that there are a number of high-quality materials at our disposition for the production of dentures. 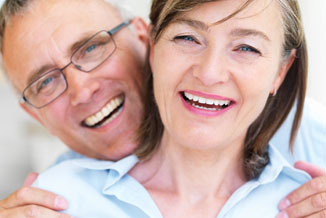 A top-quality denture restores the natural chewing function and ensures natural speech. At the same time it supports existing teeth and creates a naturally beautiful appearance. Depending upon individual situations there are different construction and mounting options. Naturally, costs also play a role. Do not hesitate to ask us. Together we will find the best solution for you. 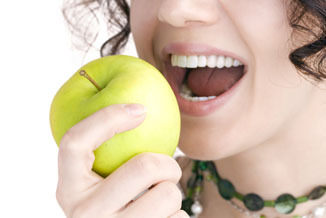 To laugh freely and to eat with firmly fitted teeth - implants offer new perspectives. They fulfil the function of roots. With their help individual teeth as well as complete rows of teeth can be replaced perfectly and almost invisibly. In doing so they generate the same secure feeling as your own teeth. Today, implants are available in many forms and materials. They offer the highest comfort, secure fitting, no speech impairment and look just like the real thing. since these do not have to be ground down like with a bridge. If several teeth have to be replaced then implants can almost carry any form of construction: Crowns, bridges, either individually or collectively combined with one's own teeth, and naturally also prostheses. With implant-supported dentures one can bite a lot safer and more strongly than with full dentures which are only secured by the mucous membrane. Please discuss with us whether tooth implants could be personally suitable for you. We will explain how they work, practical procedures as well as possibilities and implantation limits. An implant is not always the best solution. Consequently a thorough evaluation of possible risks is particularly important.